arched joists with scalloped ends. Shown above with optional lights, lattice roof, superior posts and a privacy wall. All our pergolas are constructed of the highest quality. Pergolas come in pressure treated wood or vinyl pvc. Pergolas are a beautiful enhancement to your backyard or garden. They are perfect for weddings, entertainment, picnics, long summer nights and all of your memorable occasions. They are available in various shapes and sizes. Each style offers a variety of options available, including a large range of sizes. Download a brochure (large PDF) or visit our Pergola products gallery page for specific styles available. Samples of pergolas available shown below. Styles subject to change. Call for more information. 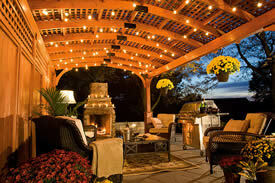 This pergola features an arched roof and is shown with optional lights. The standard Hearthside Pergola features unstained pressure-treated pine wood, solid laminated 5" x 5" posts, 2" x 6" arched joists with scalloped ends, 2" x 6" runners with scalloped ends, mounting brackets for concrete and decks. Available Sizes: 8'x13', 8'x17', 12'x13', 12'x17' Only. Beautiful traditional square pergola shown with optional lattice roof. Additional Sizes Available: 8'x8', 8'x12', 8'x16', 10'x10', 10'x12', 10'x16, 12'x12', 12'x16', 14'x14', 15' (Triangle). Many other custom sizes available. 15' Vinyl triangle pergolas are perfect to place in corners, accent your backyard, or place on a patios. Shown with optional superior posts. Traditional Wood Pergola. Shown in 15' (Triangle). Many other custom sizes available. Shown with optional curtains and superior posts. Traditional wood pergola is available in a variety of sizes: 8'x8', 8'x12', 8'x16', 10'x10', 10'x12', 10'x16, 12'x12', 12'x16', 14'x14', 15' (Triangle). Many other custom sizes available. Shown with optional curtains and superior posts. Wood pergola decorated shown with optional lights and superior posts add for a finished look. Custom ordered pergola shown attached to a back patio. Optional Lattice Roof, shown in vinyl, provides additional shade for your pergola. Also available in wood (see our colors page for an image of the wood lattice roof). 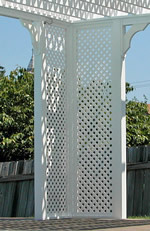 Optional Lattice corners, shown in vinyl, add some privacy for your pergola. Also available in wood (see our colors page for an image of the wood lattice corners). 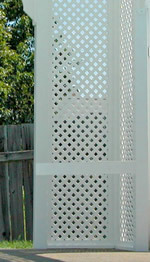 Optional vinyl benches can be added to the pergola lattice corners shown in vinyl. Also available in wood for the pergola wood lattice corners (see our colors page for an image of the wood bench). Optional superior posts can be added to the pergolas, shown in vinyl on the left. 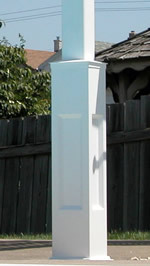 Also available in wood (see our colors page for an image of the wood superior posts). 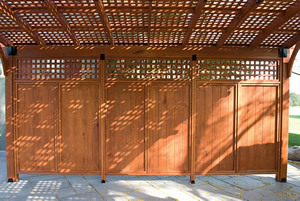 Optional pergola privacy walls available.